time, a considerable broadening out of the two separate elements. This same experiment was tried with other substances, especially with cadmium, and it was found that almost identical results were obtained with cadmium light as with sodium. It was therefore inferred that the observations announced by Zeeman were, at any rate, incomplete, and it was thought that possibly the instruments at his command were not sufficiently powerful to show the phenomena of the doubling. 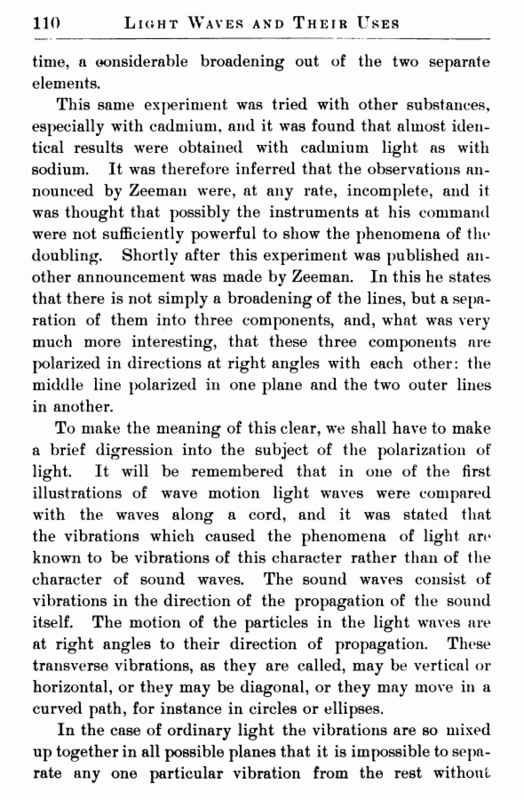 Shortly after this experiment was published another announcement was made by Zeeman. In this he states that there is not simply a broadening of the lines, but a separation of them into three components, and, what was very much more interesting, that these three components are polarized in directions at right angles with each other: the middle line polarized in one plane and the two outer lines in another. To make the meaning of this clear, we shall have to make a brief digression into the subject of the polarization of light. 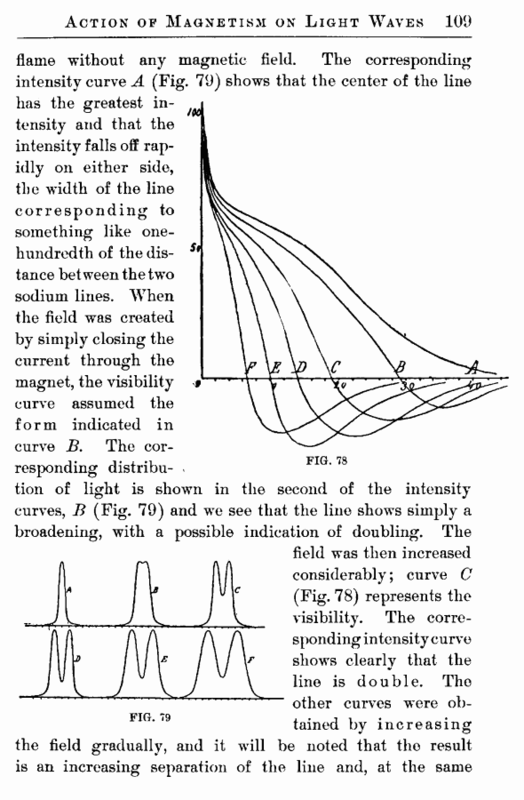 It will be remembered that in one of the first illustrations of wave motion light waves were compared with the waves along a cord, and it was stated that the vibrations which caused the phenomena of light are known to be vibrations of this character rather than of the character of sound waves. The sound waves consist of vibrations in the direction of the propagation of the sound itself. The motion of the particles in the light waves are at right angles to their direction of propagation. These transverse vibrations, as they are called, may be vertical or horizontal, or they may be diagonal, or they may move in a curved path, for instance in circles or ellipses.